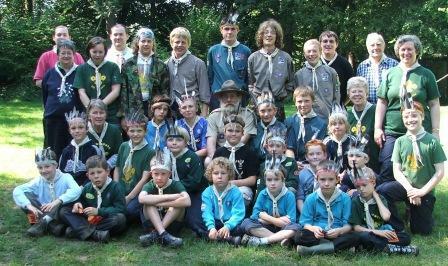 August saw a Group Camp celebrating 100 years of Scouting. The camp programme was based as far as possible on the original experimental camp on Brownsea Island including early morning exercises. Indian headdresses, staves, tracking and much more. Parents were invited to join us at the end of the day which was marked in traditional fashion with a camp fire, preceded by a beef burger barbecue and cutting of the 100 year birthday cake. In the afternoon, Sunday, egg and spoon and three legged races – or in the case of the Explorer Scouts ~ 6 legged race and then it was time for Cub Scouts to leave. Monday early morning exercises looked a little more professional, followed by a games morning – the games being taken from 1909 Scouting for Boys and a 1933 Physical Training book for schools. We are having a great time at Camp CatchaCough. Akela is making us all write to our parents in case you saw the flood on TV and worried. We are ok. Only one of our tents and 2 sleeping bags got washed away. ​Luckily none of us got drowned because we were all up the mountain looking for Charlie when it happened.. Oh yes, please call Charlies mother and tell her he is OK. He can't write because of the cast on his arm. I got to ride in one of the Search and Rescue trucks - it was cool. We never would have found him in the dark if it wasn't for the lightning. Akela got mad at Charlie for going on a hike on his own without telling anyone, but it was during the fire so he probably didn't hear him. Did you know that if you put gas on a fire the gas blows up? The wet wood still didn't burn, but one of our tents did. Also some of our clothes. John is going to look weird until his hair grows back. We will be home on Saturday if Akela gets the car fixed. The accident wasn't his fault - the brakes worked ok when we left. Akela said you have to expect something to break down in a car that is so old. That's probably why he can't get insurance on it. We think it's a neat car. He doesn't care if we get it dirty and if it's hot he lets us ride on the tailgate. It gets pretty hot with 10 people in a car. He let us take turns riding in the trailer until the policeman stopped and talked to us. Akela is a good driver in fact he is teaching Harry to drive. He only lets him drive on the mountain roads where there isn't much traffic. All we ever see up there are logging trucks. This morning all the guys were jumping off rocks and swimming out in the lake. It was great! You can still see some of the trees under the water from the flood. Ajkela isn't crabbie like some leaders. he didn't even get mad about the life jackets. .Akela has to spend a lot of time working on the car so we are trying not to cause him any trouble. Guess what? We have all passed our First Aid Badge. When David dived in the lake and cut his arm we got to see how a tourniquet works. Also Raymond and I threw up. Akela said it was probably food poisoning from the left over chicken. I have to go now. We are going into to town to post our letters and to get some bullets for rifle practice this evening in the dark. PS. How long has it been since I had a TETANUS INJECTION?